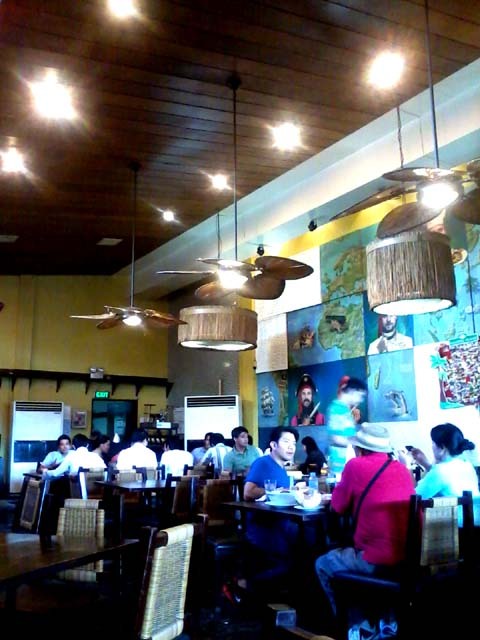 Blackbeard's Seafood Island is part of the Red Club restaurants or the Red Crab family. Their theme is pirates, seafood, and pier? 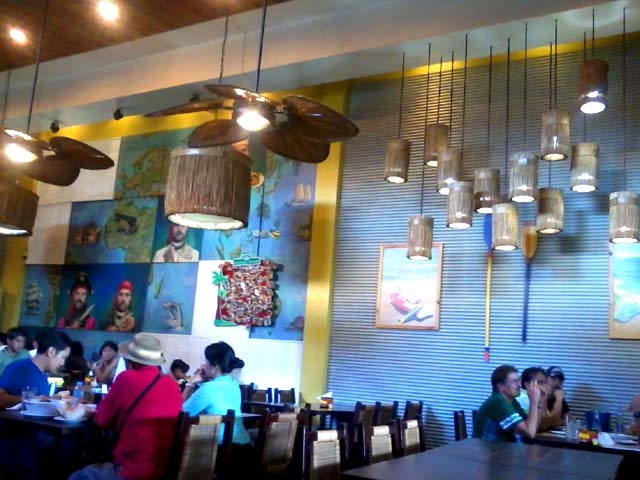 Though the interiors emit more of an Arabian-slash-beachy atmosphere. Still, we come for the food more than anything else. One of their newer branches is at SM Manila at the Cinema floor. Convenient as people coming and going to theaters are always hungry by default. Surfing board art walls? Why not. Some nice lime green cushion chair with sturdy tables. Select fishes on aquariums can be cooked fresh. More aquariums on the other side of entry. The place can get packed during lunch hours. Their famous Booble Menu manages to gather a whole pack of friends to share an assortment of seafood, rice, meat, vegetables, all plated on a leaf ala 'survivor', skewered and hanged, meant to be devoured by half a dozen pair of hands. Order counter. Waiters come to the tables so no need to approach this area. Everything seems neat and maintained. Clean toilet, with toilet paper, bidet, and freshner. 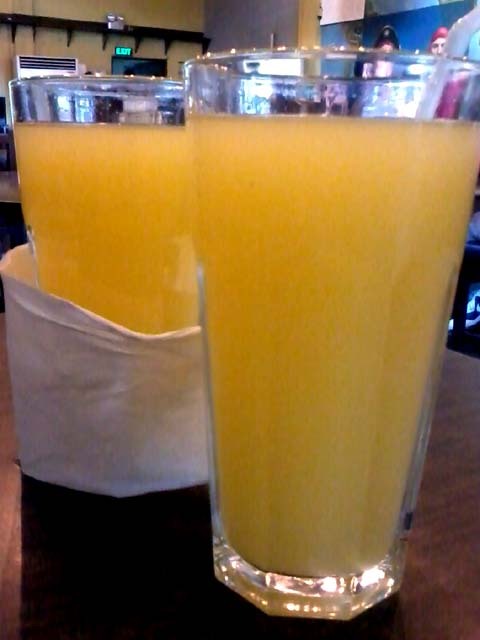 His and hers combined. Nemo on the wall? This is Blackbeard's Market!Market! branch. I personally prefer this. It's airy, with its high ceiling and long-string droplights. The pirate-theme speaks louder here. Ceiling fans for decor only perhaps. AC was in full play. Service is as friendly as your next-door pirate. Tables are set with utensils, paper mats, and some condiments. 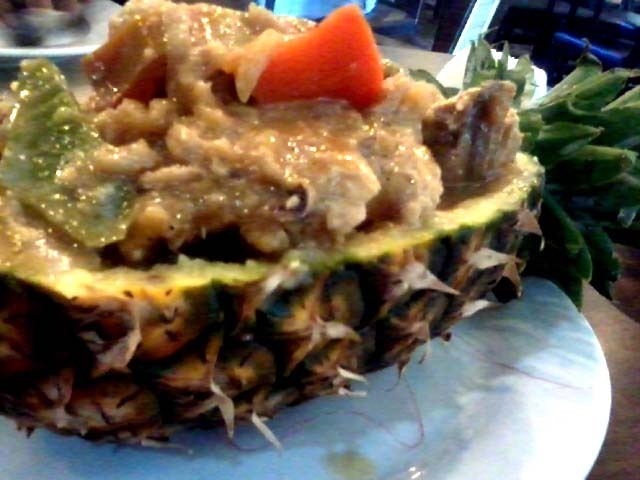 Ginataang Manok sa Piña was presented in this pretty pineapple. The fruit was hollowed and used as a bowl. Quite impressive but definitely a table centerpiece. Serving size of the their dishes were good enough for two already. Taste-wise, the squid was great. 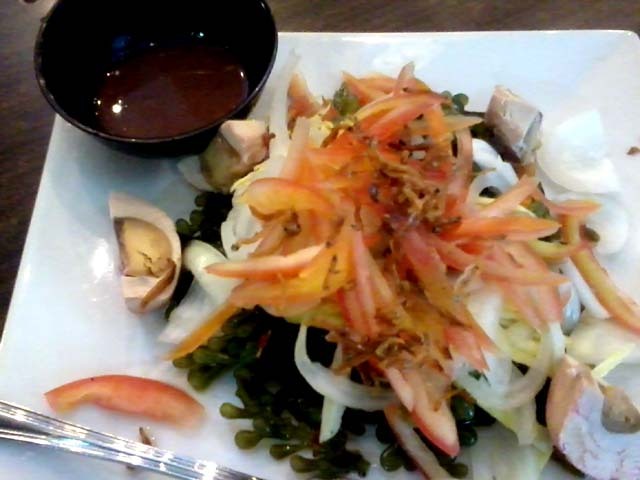 My mom loved it and her favourite so far had only been Abe's Sinuteng Baby Squid, but now this is her fave too. The Lato, which was my fave, were huge and fresh. 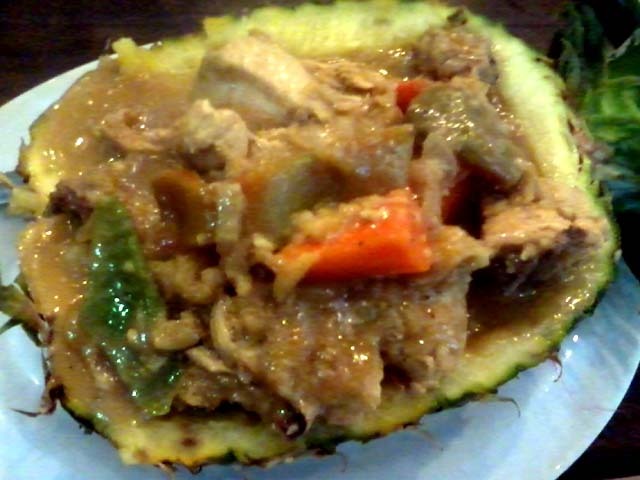 The Ginataang Manok was sweet. For groups, I guess I would suggest their Boodle meals. We saw a lot of long tables enjoying this during our visit. Good for 3-4 around Php500. Perhaps we'd do another visit to sample more dishes.